Stephen Mayfield develops sustainable products based on algae. A team of University of California San Diego biologists and chemists has been granted $2 million from the U.S. Department of Energy (DOE) to develop new methods for manufacturing products based on algae. Project principal investigator Stephen Mayfield of UC San Diego’s Division of Biological Sciences will lead efforts to develop novel platforms to produce biologically based monomers that will be used to manufacture renewable and biodegradable versions of plastic polymers called polyurethanes. 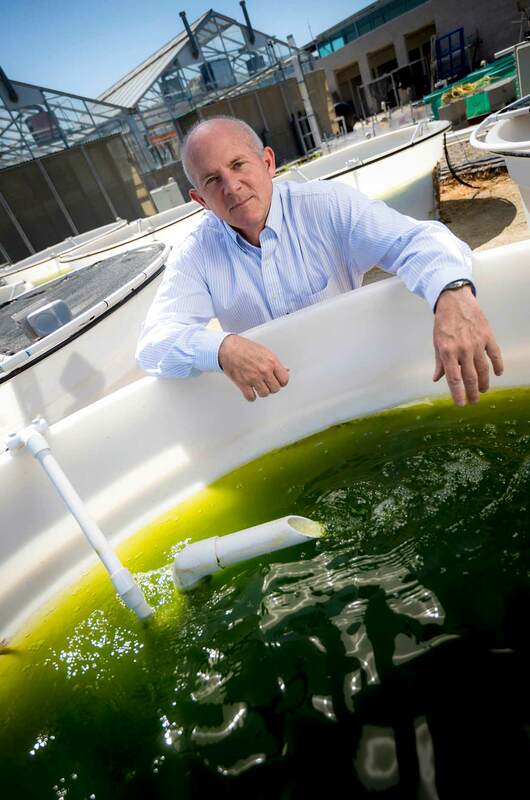 “We propose to develop novel algae platforms for the production of one of the key monomers used to make polyurethane polymers, while simultaneously developing basic tools to enable improved algal production systems that will accelerate the process from initial concept to market supply,” said Mayfield, who directs the California Center for Algae Biotechnology and the Food & Fuel for the 21st Century program. The grant is part of a recently announced $80 million DOE Bioenergy Technologies Office initiative supporting 36 projects in bioenergy research and development. In addition to bio-based products, projects include renewable hydrocarbon fuels and power from non-food biomass and waste feedstocks. Mayfield said the DOE and others are investing in novel manufacturing methods for bio-based products and markets, including algae-based polymers that will be used for a variety of plastics found in everyday items. Algae bio-based production strives to be cost-competitive with plastic products manufactured with fossil sources. Mayfield’s laboratory is developing algae for the production of human and animal foods and feeds, and as a platform for the production of recombinant proteins useful as therapeutics or industrial enzymes. He also works with UC San Diego Chemistry and Biochemistry Department Professors Michael Burkart and Skip Pomeroy in developing sustainably based products such as revolutionary algae-based surfboards and renewable flip-flops, part of an effort to replace the three billion petroleum-based shoes manufactured worldwide with sustainable and biodegradable shoes made from algae. According to Burkart, as a society, we know that we have to change our consumer habits, and this can only happen step by step. Pomeroy noted the necessity of developing such innovative products. In addition to Mayfield, Burkart and Pomeroy, the project also includes Ryan Simkovsky of Food and Fuel for the 21st Century. Other collaborators include UC Davis, Agile BioFoundry members at Lawrence Berkeley National Laboratory, Pacific Northwest National Laboratory and the Georgia Institute of Technology.